I can't believe all this time has gone by since I last wrote, must try harder. Autumn, my favourite season, is upon us and I look forward to lighting the fire again and generally settling in for the coming winter and that dreaded time of year (Christmas!!). We've had a good start to the season and sales seem to be up, our credit card machine is behaving itself (so far) and customers have been fab. Debbie has made a start on her crafty sessions with a one to one on Frenchic chalk paints. We've also had several new sellers join us and I'm looking forward to the Christmas Bazaar on 6th November in the church. Country Matters and the Lavender tearoom will be closed that day but refreshments will be available at the church. By the way, there is no entry fee for our adoring public. We've gor our mini fair and barbecue tomorrow - who gave Wimbledon permission to have the men's final on OUR day! Then we're off on our holidays for a fortnight and re-opening on Thursday 28th July. There will, as usual, be a couple of new developments when we re-open. We're very excited that we will be stocking chalk paints and all the accessories and Debbie will be offering classes on the use of those. The back room, former home of books and soft furnishings etc, will be her new domain and the main shop will take back the use of 'The Well'. As usual we can't seem to close without giving ourselves work to do! 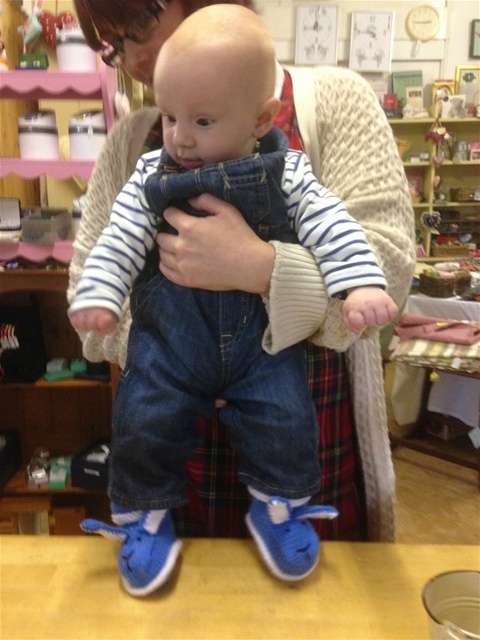 You know that a customer is satisfied when they put their new bunny boottees on before they even leave the shop!